ConnectVA and The Community Foundation are excited to share another shining example of a great person doing great work in our community, through the Help Somebody Hall of Fame – meet, Albert Negrin! How does Albert demonstrate the spirit of the “Help Somebody Hall of Fame”? 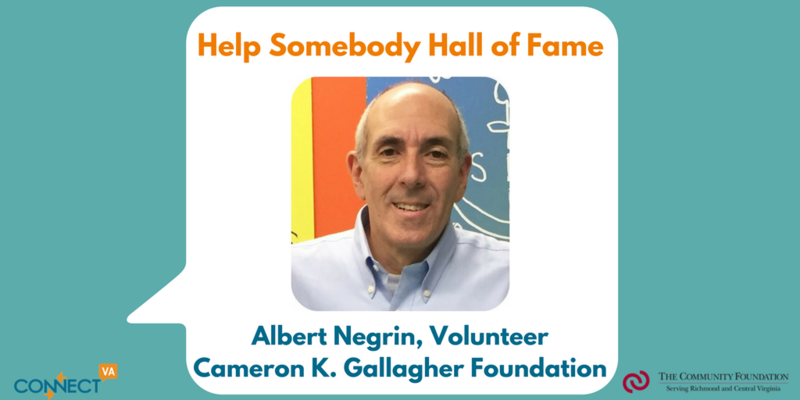 Albert Negrin began volunteering with the Cameron K. Gallagher Foundation in 2015. As the volunteer coordinator for the organization, I knew Albert would always be available and sign up for everything. I could count on him to wear a wig and stand in the heat marshaling runners at our SpeakUp5k or represent us at any event where I needed him. But Albert quickly became more than an amazing volunteer. He would go out of his way to connect us to the business community, getting food donated for our events and setting up a fundraising relationship with a new restaurant, Metro Diner. Albert began assisting the CKG Foundation after reading an account of Cameron’s life in the newspaper. He knew immediately that he wanted to SpeakUp, and help teens struggling with mental illness. What’s the impact of Albert’s generosity? Albert doesn’t just volunteer with the CKG Foundation – he has always been an avid volunteer. He works to make a difference in our society, and to give back to the community. Everything he volunteers for centers around supporting children: the CKG Foundation, the Tee Jay Vikings Fund, and St. Baldricks Foundation are all organizations that he supports. In 2012, he co-founded the Tee Jay Vikings Fund, a 501(c)(3) non-profit organization, to raise needed funds for Thomas Jefferson High School in the city of Richmond. Since then, he helped raise a little over $200,000 from alumni and community donations. With those funds, they have replaced old lockers, put in a new weight room, washer and dryer, fencing, uniforms, a new football and baseball scoreboard, a new marquee, and refurbished the mural in the library. They also started a scholarship fund, and this past fall they started installing new whiteboards. Their board consists of alumni and members of the community. This year, Albert used his connection at Thomas Jefferson High School to introduce our Program Director, Jodi Beland, and our executive Director, Grace Gallagher, to the TJHS principal, Darin Thompson, and thus bring CKG programming to that school. 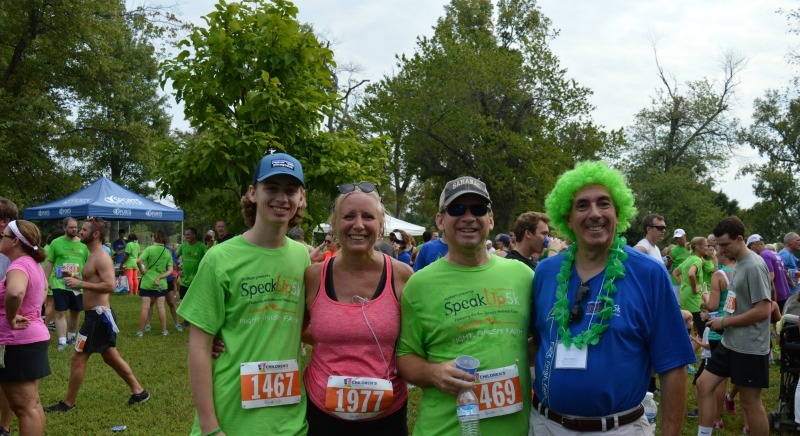 Albert at the most recent SpeakUp5k in Richmond on September 10th where he worked as a race course marshal. How could someone join Albert in giving back? 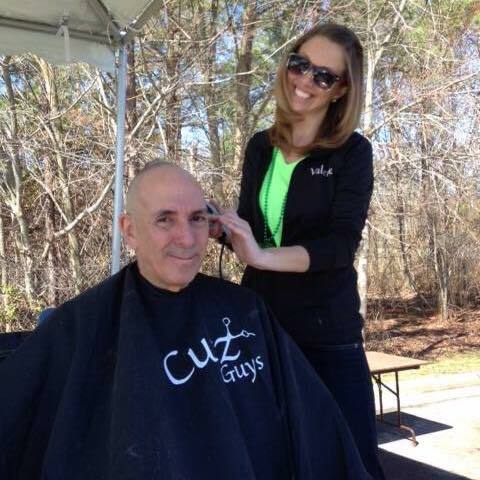 In 2013, Albert started shaving his head to raise money and awareness of children battling cancer. Kids with cancer often lose their hair during treatment. As a “shavee,” Albert shaves his head to show his support — and in the process, inspire friends and family to donate to childhood cancer research. 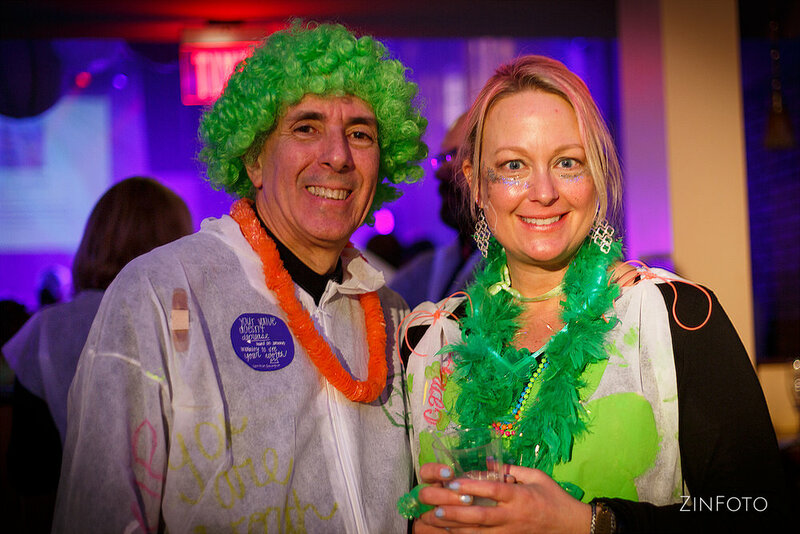 Albert is raising money and shaving his head during an upcoming fundraiser for the St. Baldricks Foundation on March 18th at Innsbrook Pavillion – you can learn more and donate here. Join Albert as he shaves his head, once again, for the St. Baldricks Foundation on March 18th at Innsbrook Pavillion to raise money for childhood cancer research!